How can I generate a One-Day Code? You can generate a one day code (1-day code) from the appointment screen. Make sure the check-box is selected next to Generate 1 Day Code in the appointment date and time section. This can also be done if the showing agent calls in later. Return to the appointment and click the Generate 1-Day Code link in the Instructions section. Can I send Mass Notifications? How do I share feedback with my seller? Will Caravans show in other products or the mobile app? Will Caravans show on calendars or reports? What is the benefit of a Caravan to the Owner? Who can Schedule a Caravan? I am a listing agent for one of the homes in the Caravan, what should I do? I want to set up a Caravan for my offices listings, what should I prepare to do? Why are email addresses so important for members of a Caravan? Can I schedule a Caravan that already took place? Can I invite agents from other offices at my company to my Caravan? How are agents notified for a Caravan? What if some agents leave a Caravan early and others stay for the duration? Can I print the Appointment Confirmation email on one page? How can I manage appointment activities? Does it matter what cell phone provider I have? Why should I update my phone's software? Can I print my Notifications? Why are access details so important on the listing worksheet? What is the Listing Activity Report? How do I manage my feedback? How do I customize my feedback template? Will my changes to the feedback template take effect immediately for all my outstanding requests? Can feedback be sent directly to sellers when the showing agent submits it? Is new feedback automatically included on my seller's Listing Activity Report? Can I resend feedback requests? Is feedback sent when I schedule on behalf of another agent? Why do I need to add access details in the 'Access Information' section of the Listing Worksheet? What does Required/Suggested Lead Time mean on the Listing Worksheet? Where can I add specific notes for the appointment staff? What does it mean to merge listings? How do I merge listings? I have an older listing in my inventory, how do I remove it? Are price change notifications sent to past showing agents? What is a Listing Agent Accompanied Showing? How can I skip a call? Why is my task not showing? Can I re-open an appointment cancelled in error? How can I search by Subdivision? 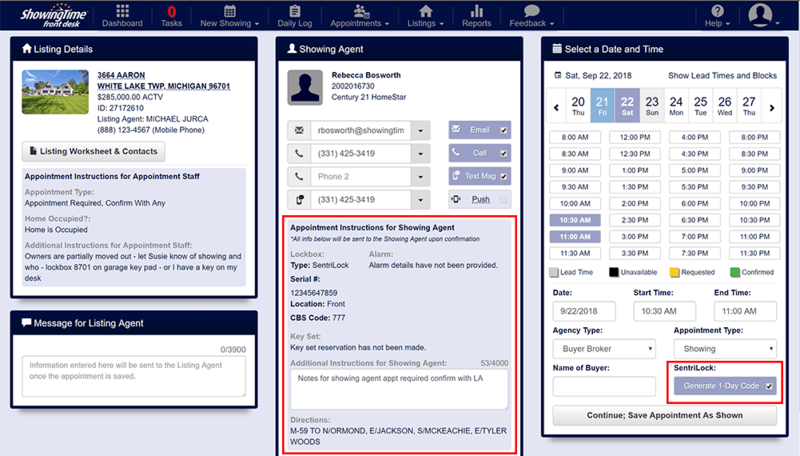 How are the showing agent notifications set up? How can I add a Buyer to the appointment? How do I choose different Appointment Types for appointments? Can I add more than one email address when scheduling an appointment? How do I cancel an appointment on mobile? How do I set my listing for a Listing Agent Accompanied Showing? How do I change my phone number/email address in ShowingTime? Where do I change my login (username and password) information? Can I upload a personal photo for my account? Where do agents setup notification preferences? How do agents enable text message notifications? I have more than one login - how do I link my account? Can I switch between Abbreviated SMS and Long/Multi SMS? What is the difference between Abbreviated SMS and Long/Multi SMS? How can I input my text messaging or SMS number? Can I set my sellers or their occupants up for text messaging? What is the preferred interface switch for? Help! My password is not working. What are my Sellers Notification Preferences? How do I Schedule a ShowingCart Tour? Can I share the tour details with the buyer? I missed a message while with a client, where can I find it? Why do I get a message that says "URL Expired" from the mobile app? Can my seller communicate with ShowingTime? When I share the feedback with my owner, what will they see? How do I clear the Call Now Task List? What is the office filter on the task list for? How can I make sure my sellers are receiving emails? How can I enable my agents for access? How will I know how my ShowingDesk deployment is progressing? Multiple Listing Services, FrontDesk and You. 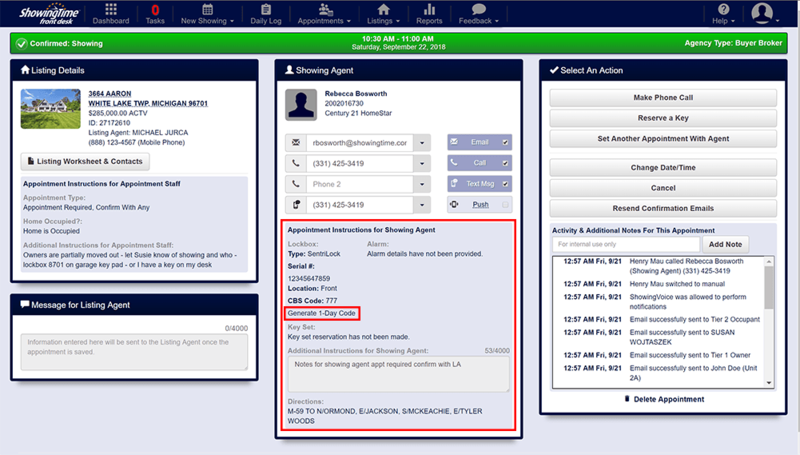 Can showing agents calling in be added manually to FrontDesk? What is the difference between and Office Manager and Office Staff? How do I hide Cancelled Showings on the Task List? How do I Resend the Confirmation emails? How Do I send A Price Change Notification out? How do I change my Company Logo? How do I edit an Agent's Profile? Can I manually add a listing? How can I see Past Notifications I have sent? I've been told that agents can't schedule inspections on my listings, what do I do? Can I change the office details? Do you have information that I can provide to my seller? What does "Display past appointments older than..." mean? My password is saved and I can't change it. What is a custom status? How do I Require Buyer's Name for my Office's Appointments? How do I add Owners or Occupants? What is the Not Authorized Message? How can I remedy issues with the Mozilla Firefox Web browser? How can I remedy issues with Internet Explorer? How can I remedy issues with the Safari Web browser? How can I remedy issues with the Google Chrome Web browser? How can I troubleshoot browser issues? Can I resend the confirmation email? What is ShowingTime Live Connect?